SEAN: There are a pile of things out this week I’m interested in. The final After Hours, new volumes of Horimiya, Silver Spoon and Yowapeda. But I’m sorry, I cannot resist a croc in a top hat. Especially when it’s secretly a foodie manga. Crocodile Baron is my pick this week. MICHELLE: And I can’t resist sports manga, so it’s totally Yowapeda for me! ASH: I’m definitely looking forward to the most recent (and far too infrequent) release of Yowamushi Pedal, but my pick this week goes to The Golden Yarn. I’m curious to see if The Ancient Magus’ Bride holds the same sort of dark charm in prose as it does in manga. ANNA: I almost have to pick Crocodile Baron just for the cover, but I am nothing but steadfast in my championing of romance, so I’m going to go with Ne Ne Ne as my pick. MELINDA: SILVER SPOON! SILVER SPOON! SILVER SPOON! 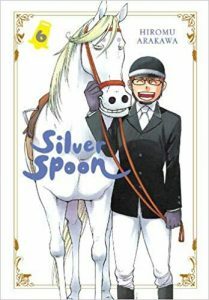 KATE: At the risk of sounding like a broken record, I’m throwing my weight behind Silver Spoon again, if only to remind everyone that it’s REALLY good, and they should be reading it.